We have a history of neglecting the fruits of our garden, and here is another instance. We grew a bunch of little delicata squashes last year, which were a bit of a pain to use because they were kind of petite. So down into the basement they went. We’re trying to pinch pennies these days, so in scouring the food storage, Alicia found them and decided it was time to make some risotto. 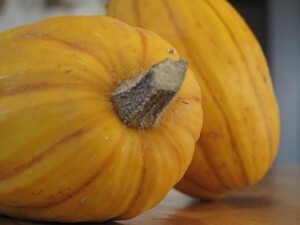 They had changed colors from white with green seams to a golden yellow, almost like little pumpkins. Those things were over a year old, and still going strong… talk about staying power.